When square footage costs are low your dollar stretches further. There are many things you need to keep in mind when you’re buying a home. Where you decide to buy will determine how much house you get for your money, as the price per square foot varies widely across the country. A recent GOBankingRates study looked at the median home listing price per square foot in every state and the District of Columbia, sourced from Zillow’s home price index. 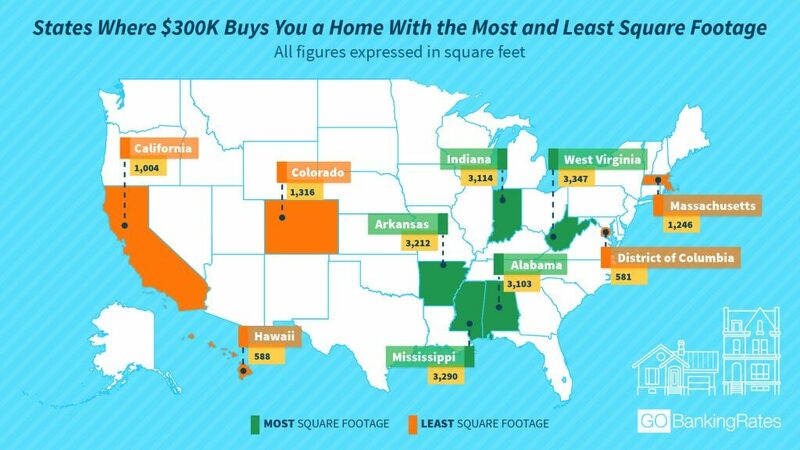 To determine how much home $300,000 buys, we divided $300,000 by each state’s price per square foot. Click through to find out how much a home is worth in every state and read on to see the states where $300,000 stretches the furthest. In the Mountain State, $300,000 will buy you a 3,347-square-foot house, and the median list price per square foot in the state is $89.62. Like most states that rank among the best for buying a home for $300,000, West Virginia average income is lower than the U.S. as a whole — $43,385, compared to the U.S. average of $57,617. Learn whether it’s better to buy or rent in every state in the country. In Mississippi, median list prices are just over $91 a square foot, which means you can buy a 3,290 square-foot house with $300,000. The state, however, ranks dead last among the most and least fiscally successful states. With list prices per square foot at $93.41, $300,000 will buy you a 3,212 square-foot house. The median income in Arkansas is $42,336, but it’s also one of the states where $1 million will last the longest in retirement. Like other states where a $300,000 home-buying budget goes the furthest, Indiana serves up prices that make getting a large home likely. With a median square foot price of $96.35, your $300,000 will buy you a 3,114 square-foot house. Indiana has some of the lowest income taxes in the nation, making it one of the most tax-friendly states for retirees. The best states to buy a home for $300,000 tend to be in the central or southern region of the U.S. These states have a lower cost of living overall and aren’t as wealthy as other areas of the country. When shopping on a budget, avoid areas such as Hawaii, Washington D.C., the Pacific Northwest and the Northeast, where prices are higher. Click through to learn the salary you need to earn to afford the average home in your state. Methodology: GOBankingRates determined the median home listing price per square foot in every state and the District of Columbia, sourced from Zillow’s home price index, using the most available data as of Feb. 28, 2018. To determine how much home $300,000 buys, GOBankingRates divided $300,000 by each state’s price per square foot. Zillow did not have state-level data available for North Dakota, so GBR found the median list price per square foot from a sample of six of its largest cities — Williston, Dickinson, Fargo, Bismarck, West Fargo, and Watford City. A new study identifies the best cities for first-time buyers.